The Mitsubishi 4wd Owners’ Club of WA was established in 1986 after Ian Lockhart, an owner of a long wheel base Pajero, placed an advertisement in the Sunday Times seeking the interest of Pajero owners’ in forming a Club. The primary objective was to facilitate the exchange of information and skills among members with a view to the promotion of social interchange, the enjoyment of responsible four wheel motoring and the safe operation of vehicles. The first meeting was held in May at Mitsubishi Australia State office in Kewdale with thirty attendees. Ian explained his vision in forming a Club and Mitsubishi agreed to provide sponsorship to assist its development. The Service Manager, Bill Waterer, arranged for raffle prizes to be provided to assist with fund raising. Membership was at first restricted to Pajero owners but as the Club grew and drivers’ became more experienced other makes of vehicle with off road capability joined the convoy each month. It was soon realised that the viability of the Club depended on a diversity of vehicle models. A Steering Committee was established to set guidelines for Club. Its members were, Ian Lockhart as Chairman and Caroline Stavely as Secretary, although soon afterwards a Management Committee was formed with Ian Lockhart as Foundation President, Ray Edwards Vice- President, Simon Mathews Treasurer and Caroline Stavely as Secretary. The first meetings were held either at Mitsubishi Motors in Kewdale or at Harry Dutton’s dealership in Melville. Southside Mitsubishi in Cannington has been the major sponsor of the Club. The membership in the first year was forty-one Pajero owning families. It was a busy year for the inaugural Committee. The Club became an Incorporated Body under the Government Act, a Constitution was formed, a Code of Ethics developed and very soon it was realised that training of drivers was essential. The Club also affiliated with the Western Australian Association of Four Wheel Clubs, the peak body for 4 Wheel Drive Clubs in WA. It is a National organisation. The value of radio communication was not well understood or indeed what equipment was necessary for the recovery of a vehicle. A 4WDriver introductory pack of essential information such as mandatory equipment to be carried, radio communication and convoy procedure was developed and training days became regular features of the calendar. Valuable assistance was provided by Eric and Ronnie Gard, the Western Deserts Expedition Guides. The first day trip was an excursion to the Darling Range on a very wet day and 4WD was not used as there were other important new skills to develop such as teamwork and convoy procedure. This was followed by a sand driving training day at Canning vale and the next month a real 4wd excursion through Lancelin to Ledge Point was enjoyed. For most people this was a first off road driving experience. Ian Lockhart held office for two years before succumbing to a sudden illness. His enthusiasm and happy nature was a unifying force for the fledgling Club. He was held in such high esteem that the Ian Lockhart Award was perpetuated with the agreement of his wife Shirley. This Award is a certificate presented a member annually in recognition of service and commitment to the objectives of the Club. In 1990 it was decided to introduce another Award, this time for the most amusing but perhaps careless incident involving a driver on a Club outing. It was called The Piston Broke Award. The first recipients won this by doing such things as when, tail-end Charlie lost the convoy because convoy procedure was not followed, a driver had difficulty crossing a sand dune at Lancelin because the hand brake was on, and another did not tighten the wheel nuts fully after a wheel change and the wheel surprised him as it rolled ahead on a gravel road. Over the twenty five year history of the Club a greater professionalism has developed and the Club’s Policy and Procedure manuals were reviewed in 1993, 2005, and 2008 and again in 2012. A large number of the current sixty eight member families have Driver Training certification and most have a current Senior First Aid certificate. Members are actively involved with environmental projects done under the direction of the Department of Environment staff and substantial grants have been awarded to assist with the work required. 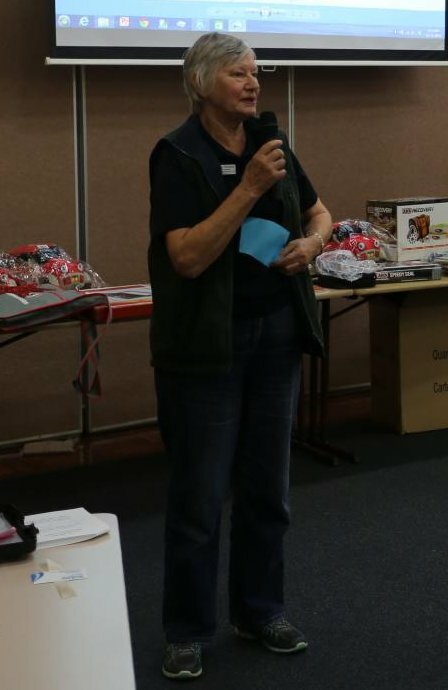 Members are also represented in associated organisations such as the WA 4WD Association and Track Care and regularly participate in inter-club events. Before 2000, on many occasions the Mitsubishi 4WD Owners Club assisted other Clubs in the WA 4WD Association with CALM (Department of Conservation and Land Management) staff in undertaking tasks required in the Pemberton area and other locations such as Wilbinga. However, in the last decade although assistance was given to Inter-Club activities such as the re-building of the facilities at the DEC (formerly CALM) property, Lake Mason, its focus became two closer areas Leschenault Conservation Park at Australind since March 2001 and Wungong Regional Park since July 2007. The Club magazine began as a single sheet of Newsletter typed and photocopied for each member. Later when trip notes and flyers about coming events were planned it became a few stapled sheets. The new technology of the 1990’s allowed a coloured front page and colour photos to be included and further improvement resulted in a coloured booklet. The cost of printing the magazine until recently was subsidised by John Bromberger. The development of a Club web page and all the new information system communication tools means that many members view Club minutes, news, events scheduling and photos on line making the printed magazine less relevant and saving printing and postage cost. The two Awards introduced in the early years, The Ian Lockhart Award and The Piston Broke Award, are now considered insufficient to recognise the diversity of talent and contribution made by the large membership. The Management Committee decided that it was necessary to have new categories of recognition. The first new category was an award for the best photograph submitted to the Club magazine. In 2009 a Photo- Of- The -Year (POTY) Award was introduced. The Magazine Editor selects the photo and the winner is given a framed enlargement of their photo. In 2012 a new Award, the Club Member of the Year Award, will be given to the member who has collected the most points over the past year. Points are awarded to a member for every occasion of Club contribution. This means that every member, not only those who have charismatic personalities, will have the opportunity for recognition. The range of occasions include but are not limited to attendance at meetings, contributions to the Club magazine, arranging day runs or weekend events, social events or guest speakers, attendance at meetings, day runs, weekend events, environment working bees, arranging or presenting training programmes in Senior First Aid or 4WDriving and Committee work. Awards are presented at the Annual General meeting in March. Members who have fifteen years of consecutive membership and have made a considerable contribution to the life of the Mitsubishi Club are awarded Life Membership status. There have been only three couples to 2012 that have met the criteria. They are Warren and Maxine Gosney (1986 – ), Reg (deceased 2009) and Dorothy Hill (1987- ) and Tony and Stella Weldon (1990-). John and Sue Bromberger, members since 1994 were the last to receive this recognition of long service to the objectives of the Club. This has now been changed to 20 years of membership with a substantial contribution to the activities of the Club. In 2009 the Mitsubishi 4WD Owner’s Club was awarded by The Minister for the Environment and Conservation an Outstanding Service Award for enthusiasm and commitment to Leschenault Conservation Park. The Club receives from the Department and Environment a Park Pass valued at $80 per vehicle or $50 per concession driven vehicle. One Park Pass for every 50 hours of voluntary service work at Wungong Regional Park near Byford and the Leschenault Conservation Park at Australind is issued. In 2011 the Environment Officer Tony Weldon was awarded an Outstanding Service Award from the Department of Environment and Conservation for his continuing commitment and encouragement for the Mitsubishi 4WD Club and the Leschenault Environment Group. The West Australian Motoring, November 16 Club’s Coastal Clean-up. Leschenault Peninsula benefited from a thorough tidy-up. Tread Lightly Trails Journal Vol2. What’s a MCLEG? The Mitsubishi 4WD Club participates in work necessary to restore and repair the damage done to the environment at Leschenault Conservation Park- Mitsubishi Club Environment Group. Conservation News February edition 4WD Club cleans up park. Leschenault Peninsular Conservation Park near Bunbury has received some tender loving care from a 4WD Club. The West Australian Motoring, May 3 Off-roaders Lend A Hand. About 150 people in their 4WD made the trip to Lake Mason. Advance notice of this activity was published in the West Australian newspaper, motoring section, on April 19. Conservation News June edition Lake Mason Station Renovation. A homestead at former sheep station Lake Mason received a much needed makeover on the Easter weekend by volunteers and Department staff. The West Australian Motoring March 20 Open Days Prove Popular. Following the keen interest at the Perth4WD Show…two open days for visitors, one at Lancelin and the other at White Hills, south of Mandurah. The West Australian Motoring May 12 Cleaning Up The Bush. The Mitsubishi Club of WA has been assisting the Department of Environment and Conservation since 2001 to maintain and improve the peninsular just north of Bunbury. Serpentine-Jarrahdale Examiner September 18. Damage angers residents and 4WD owners.Members of the Mitsubishi 4wd Owners Club have cleaned up 12 tonnes of rubbish in the Wungong Regional Park over the past 12 months. The West Australian Motoring July 10.First Aid a priority. The Mitsubishi 4wd Owners Club of WA in known in 4WD circles for its commitment to provide a safe and enjoyable environment for members and guest during club activities. The West Australian Motoring March Club’s silver lining. Off-road fans: the Mitsubishi 4wd Owners Club celebrates its 25th anniversary this year. The Club has matured as a community organisation. It has gone beyond its beginning when the sole purpose of forming a social group all of whom drove a Mitsubishi Pajero was to develop skill in driving a vehicle using 4WD in an off road situation. Once members had the opportunity to be out and about in the far reaches of this State an awareness of responsibility for the environment developed. It is more than picking up rubbish or planting trees; it is being custodians for a new generation of drivers who might wish to experience the desert areas or the river valleys off the beaten track. Many members view the Club as a second family and, with the variety of events scheduled during the 25th Anniversary year, it could be seen there was an event for every driver’s level of experience. Visitors and prospective members continue to be welcome at the monthly meeting held on the first Wednesday of the month.